Do you have the urge to play crossword all day long and love every bit of it completely? Does taking out time from your busy schedule for playing a game of crossword makes you happy? Are you that crazy crossword aficionado who loves everything about these cryptic puzzles? Well, if you are nodding in affirmation at any of these questions, you my friend, should definitely try your hands at Wealth Words! Yes, if diving in the world of words is your idea of happiness then making money with crosswords is only going to elevate your mood. Wondering what I am talking about? Clueless how can you think of making money with crosswords? Is it really possible? Well, the answer to all of these questions lies in the fact that Wealth Words is a contemporary online crossword that came and conquered the world of crosswords by introducing real money and cash prizes as winnings. Isn’t this downright amazing? You might have played enormous crossword puzzle games, won almost all of them but, what did you get in return? Yes, of course, it’s a great buster and induces one with instant gratification. In fact, you might even have been applauded by everyone for being an ultimate wordsmith, right? However, that’s about it. You got nothing more than that. And, then comes this amazing online game where you can put your best puzzling foot forward while making money with crosswords. How amazing is that? Isn’t it a cherry on the cake? I swear it’s an absolute delight for all the crossword lovers and experts out here. Excited already? Just register at its website and feel the adrenaline rush as you get lost in its enticing word games and win it all. Take my words, while playing and making money with crosswords at Wealth Words, you are certainly gonna fall in love with this word game all over again. So, are you up for a game of Wealth Words or two? After all, it’s not every day that you can laugh all the way to bank while making money with crosswords, right? And, that too a lot of money. Yes, you can win a lot at Wealth Words with a little precision and smartness. All you need to do is of course register at its website, purchase few tokens for $2 each and get going by grasping all the clues and cues that come your way. Remember, the faster you grasp the clues and submit the correct answers in an active time frame of one hour, the higher are your chances of being in the ultimate race of winning and making money with crosswords. Sounds cool, doesn’t it? From division 1 and division 2 cash prizes to its super word puzzles and other short, active games, there’s a word puzzle for anyone and everyone at Wealth Words. While taking home division 1 cash prizes requires you to answer all of its 20 puzzles just right, winning division 2 cash prizes is a little easier comparatively as it requires you to be on the second highest correct answers slot. Pretty convenient, isn’t it? Moreover, as far as its super word and other active game is concerned, you can win bigger and better pool of cash prizes by answering all the 25 word games correct at the super word puzzle. Also, you can win cash prizes as big as a whopping $2300 by playing its short, active games ranging anywhere between 2 to 20 words. Well, it won’t be wrong if I say Wealth Words comes with an undeniable charm and lots of cash prizes, of course. In fact, there’s another value added feature of Wealth Words too. Willing to know about it? Well, the fact that it has an open game which requires no registration and token purchase and allows puzzlers to polish their skills before jumping in this oh-so-alluring bandwagon of this online crossword is really commendable, isn’t it? 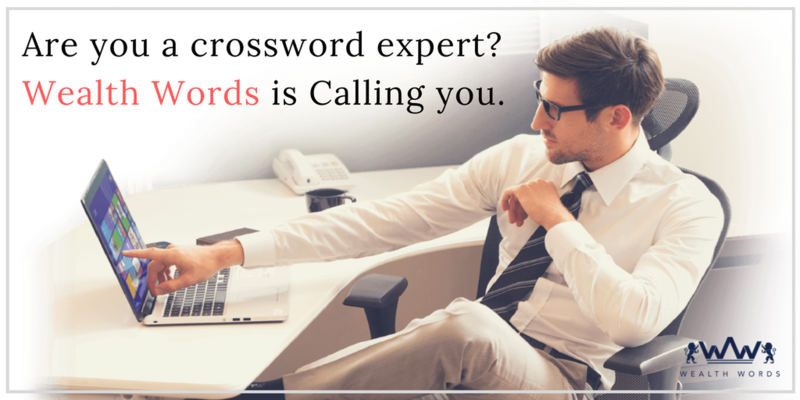 So, come, unleash your inner wordsmith and make the crossword aficionado within your happy by playing Wealth Words and making money with crosswords instantly. Trust me, it couldn’t get any better. Keep playing, keep puzzling and keep winning, of course!